The idea of a bread tasting had never occurred to me, but when the breads are as unique and layered in flavor as fine wine, why not? 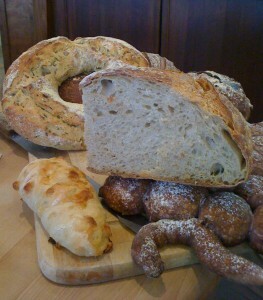 Lionel Vatinet offered the tasting of breads from his upcoming book at La Farm Bakery in Cary, which he opened in 1999. Instructions to make the breads will be featured in “A Passion for Bread: Lessons From a Master Baker – Seven Steps to Making Great Bread” which will be published in November. It will be the first book for Vatinet, who trained in France (where he apprenticed for seven years) and San Francisco. The book is full of photos that show each step of the process for novice bakers, part of Vatinet’s goal of helping home cooks make beautiful fresh loaves. We started with Vatinet’s classic 5-pound boule. And I found out why the sourdough-flavored loaf is so large. The recipe, Vatinet said, goes back to the tradition of communal ovens in small French villages. Villagers would bake loaves large enough to last their families for several days, and would mark each loaf with an identifying crest. My previous experiences with all-whole-wheat breads has been that they were suitable for sanding down furniture. Vatinet’s was soft and flavorful, and he uses North Carolina grown and milled flour from a newly opened mill near Asheville, Carolina Ground. Beaujolais replaced water in another bread that included chunks of salami. But, of course, my attention was drawn to a bread using cornmeal, onions, chives and buttermilk. I’m thinking that this fine-textured bread would make the base for a great grilled cheese sandwich or interesting in a savory bread pudding, if it hung around long enough to get stale. Many of these breads are not regularly available at the bakery, but Vatinet says he will offer them more often once the book comes out. He had taught baking classes at La Farm for years, and enjoys passing on knowledge. “People want that touch with the earth from making the bread,” he says. Every Valentine’s Day needs chocolate, and when I posted the photo of this dessert on my Food Writer Debbie Moose Facebook page, requests came in for the recipe. It’s so simple, and has an interesting history. Chocolate cake using mayonnaise instead of butter and milk became popular as a cost saver during the Depression, and it was also popular during the rationing period of World War II. It makes a devil’s food-like cake that is so simple, kids can make it. In fact, I demonstrated this recipe for a group of teachers at a teachers’ seminar focusing on WWII. The only caveat is don’t overbake it to prevent dryness. I added a drizzle of melted bittersweet chocolate to make it even more of a Valentine’s Day treat. This recipe makes enough to fill a 9- by 13-inch baking dish, but I used an oversized muffin pan to make six individual cakes. I cooked the remaining batter in a smaller baking dish, dusted the resulting large cake with powdered sugar and gave it to my neighbor, who has two kids and is expecting a third – just to spread the Valentine’s Day love (and get the calories out of my kitchen). I adapted this from a recipe in “The American Century Cookbook” by Jean Anderson. Preheat the oven to 350 degrees. Spray a 9- by 13-inch baking dish or equivalent muffin tins, etc., with nonstick cooking spray. In a medium bowl, combine the flour, cocoa, baking soda and baking powder. Set aside. In the bowl of a stand mixer (or use a portable electric mixer) combine the eggs, sugar and vanilla. Beat on high speed 3 minutes or until light and fluffy. Reduce the speed to low and beat in the mayonnaise just until blended. With the mixer on low speed, stir in the flour mixture in 4 additions alternately with the coffee or water, beginning and ending with the flour mixture. Pour into prepared pans and bake 20 to 30 minutes, depending on the size of the pan (the muffins will take less time). Bake just until a toothpick inserted in the center comes out clean; do not overbake. Cool for 15 minutes or so, then remove from the pans and cool completely before frosting, drizzling with melted chocolate or dusting with powdered sugar. It’s the reason for stocking my freezer with sausage balls. (They’re expressive projectiles AND snacks!) It’s why the house rule is that all present must shout “Ferret! Ferret! Ferret!” whenever Coach K’s face appears on the TV screen. It’s why The Hub will come home tonight and ceremonially don the lucky Carolina Blue argyle socks. My father and I were basketball nuts together. My mother never got it, never understood why he and I would spend an hour on the phone talking about something that happened three nights earlier. She really didn’t understand why he once drove three hours on icy roads to Raleigh because I’d gotten tickets for the two of us to the Dean Dome. Or why, as a child, he tried to convince me that they called him Dean Smith because he was dean of the whole school. Recent developments indicate that he might not have been too wrong about that last part. I know that college basketball is riddled with problems that need to be solved and as a graduate, I do resent the cheapening of college degrees by allowing athletes to take no-show classes and other such things. But I need one thing in my life that I can be childish and stupid about. Just one. Please. About everything else in my existence, I’m a grownup. I do weight-bearing exercise, try to eat more kale, save for retirement, meet book deadlines, avoid drinking to excess, make sure my cats’ rabies shots are current and get my car’s oil changed on time. Those few hours from November through March when I become a screaming, trashy-food-eating, in-the-moment crazy woman are my right. I’ve earned them. So, no, it’s not just a game. Especially if the Heels win.